Steve Stohr provided thses images of a P-40E he took at a local airshow. Back a number of years ago I became infatuated with the Me 262B night fighter. This was before the internet was widely available to be used as a research tool. I began scouring any references that I could find but as usual nothing agreed from plans to colors! There were 2 Me 262Bs left in the world, a night fighter in South Africa and another trainer at Willow Grove. Slowly I began to get a lot of information which started to make sense and I started to compile a lot of this stuff with an interest in the colors of the 4 Me262Bs that were captured at the end of the war. One of the interesting finds was that the 2 seat trainer and night fighter did not share the same exact fuselage, many detail differences. About this time along came an organization called Luftwaffe Circle which was run by a professor in Alabama and was devoted to all things Luftwaffe. I was asked to compile the color information into an article to be published in the organizations journal. Tom Hitchcock of Monogram Aviation Publications vetted the article and the president of the Luftwaffe Circle had it vetted by I believe Ken Merrick in preparation of it being published. After I finished this and got it sent off for publishing it was to be accompanied by color chips done by another member which was never completed. About this time my company sent me to Irian Jaya (the former Dutch New Guinea) to live for a bit more than a year flying our Grumman seaplane in support of gold mining operations. By the time I had gotten back to civilization on a permanent basis the Luftwaffe Circle had succumbed to the internet as publishing a monthly news letter for 30 members and mailing it out just didn't make sense, so the article was never published and the Circle was disbanded shortly thereafter. I had kept the article and added updates as more information became available and thought that the Vagabonds site might be a good place to park the updated article. I must emphasize that with the exception of Red 8 the color interpretations are mine alone. You will certainly find different variations in profiles and other descriptions of these paint schemes. At the end of WW2, 10/NJG11 was based at Magdeberg about 73 miles from Berlin and was tasked with helping to provide some air defense to the night time German skies. Among the aircraft assigned were 4 Me 262B-1a/U1 night fighters. The a/c were converted by the Deutsche-Lufthansa workshops at Berlin-Staaken. The four Me262s were captured intact and were very well documented photography and give a good insight into late war German night camouflage schemes. The overall uniformity of finish, application of undersurface colors, stenciling, etc. asks the question if the a/c were painted at the point of manufacture (actually conversion) or in the field to suit local operating conditions. Of course, at that point in the war the "field" was not that far from the point of manufacture and the front was overhead a few thousand meters. The colors discussed are the standard Luftwaffe colors used during the middle and end of the war. There are a couple of other colors that are mentioned that are not often in the standard Luftwaffe color palate discussion. A dark green primer RLM number unidentified used by Messerschmitt . 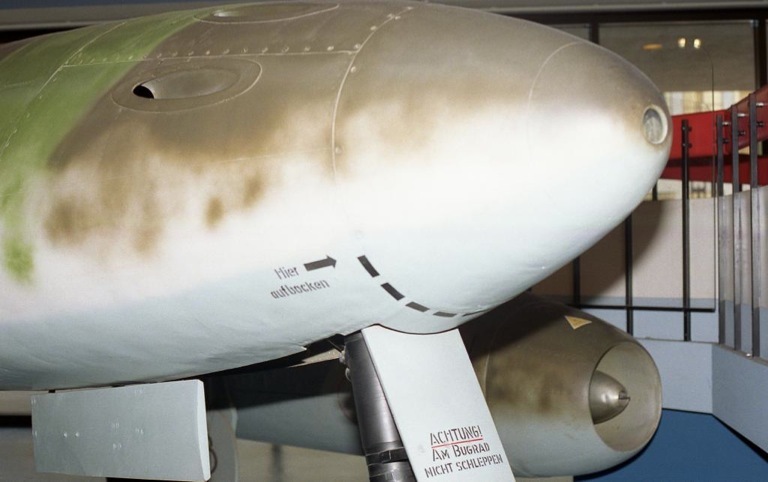 A light gray primer that was found on the flanks of the NASM's Me262. It should also be pointed out that by the end of the war RLM 76 had become a very pale washed out color in many instances, and I do wonder if some of these a/c may have had the light gray primer applied as a top coat instead of RLM 76. I have no proof of this just supposition on my part. In the text there are references to simplified late war markings. 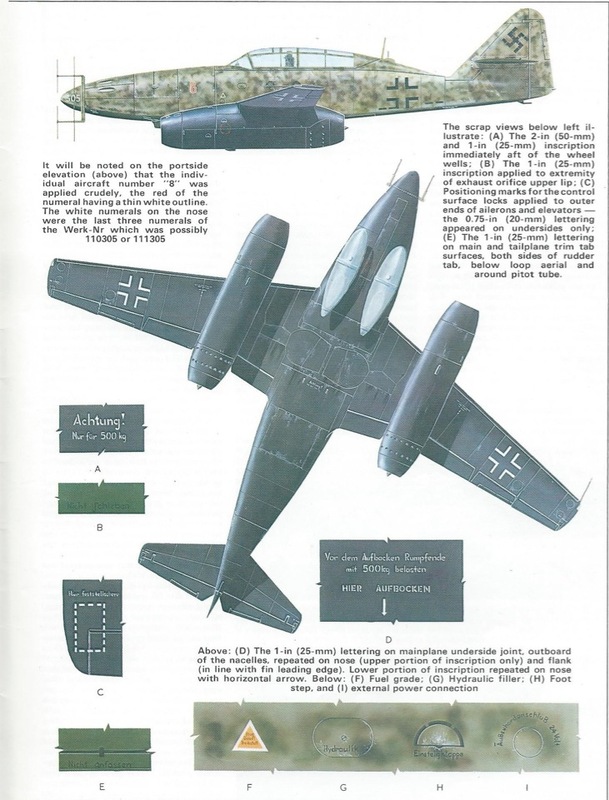 Basically these are simple outline balkenkreuz in black on the fuselages, white on the upper and lower wings (Red 10 probably had black upper wing balkenkreuz ) the swastikas were "fractured" on the arms by the use of a stencil. So let's take a look at the individual a/c. There were 4 of these night fighters captured at the end of the war. There may have been others but I have not seen documentation or photos. The latest table I have shows 9-10 of these a/c completed. An overall finish of RLM 76 (possibly the light gray primer color can be considered) with a random mottle or in some areas serpentine lines of RLM 75. It is possible that the color may have been RLM 82 or 83 but tonal comparisons lead me to believe that the color used was RLM 75. The wing tops and nacelles also received a mottle application. The paint application varied from small mottles, to squiggles to an elongated solid to translucent mottle. Close study of photos also reveals that there was a distinct difference in the style of paint application, the right side of the fuselage having a more elongated, translucent, serpentine application. The left side has a more random mottle of shorter more opaque strokes. There is a large patch of RLM 75 at the forward base of the vertical fin, the antenna mast is mottled, and the upper radar supports have an overspray of RLM 75. I think it is safe to assume that the wings had pretty much the same application as the fuselage. Photos of the extended flaps seem to bear this out with perhaps more bias toward a serpentine mottle some translucent, some opaque. The upper surfaces of the horizontal stab were finished in solid RLM75 as is the adjacent faring. The canopy framing was fairly solid RLM75 on the right side more mottled on the left. The undersurface was painted in black RLM22 probably the permanent color, not the temporary distemper. The undersurface demarcation ran along the lower fuselage chine line, along the centerline of the leading edge slats, and along a gentle down slope along the sides of the engine nacelles front and rear, there being some difference in the demarcations on the outer nacelle flanks. 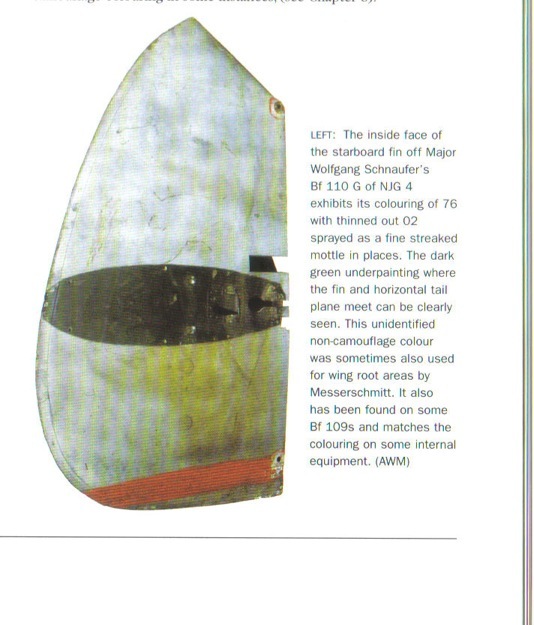 The bottom of the horizontal stab was finished in RLM 22 black along with the adjacent fairing, as were the lower radar support arms. The drop tanks were black worn down to either natural metal or primer on the forward ends. Was it possible that the tanks were painted in the temporary distemper? The a/c carried simplified late war insignia and stenciled swastikas The Red 10 was thinly outlined in white and the aircraft did exhibit some stenciling, but it is not known if a full set was applied. The full work number was carried on the vertical fin in black. Overall finish of RLM 76 (again the possibility of the light gray primer can be considered). The fuselage was given a mottle application of RLM 75 which appears to have been applied with the spray gun set to a "fan" type spray pattern. The mottles on the left side being somewhat elongated while the mottles on the right side were more of the "blotch" type. The mottling varies from opaque to translucent. The canopy frames were mottled as were the upper radar support frames. The antenna mast seemed to have an overspray of RLM 75. The upper surfaces of the wings, nacelles and stab appear to be painted in solid RLM 75. However the upper wing/fuselage fairings and upper and lower horizontal stab fairings were RLM 76 mottled with RLM 75. The undersurfaces were finished in RLM 22 the demarcation between the upper and lower colors being similar to Red 10 as was the application of black to the lower radar support arms. Also similar was the application of insignia, again it is not known if full stenciling was applied. However, red warning circles were applied on the nacelle flanks. The last 3 numerals of the work number was applied to the nose probably in white, no work number was applied to the fin. There are some references to this a/c as Red 6 but I have not seen a photo to positively confirm this number was carried. The drop tanks were uniform black-no worn paint. One other note there are photos after capture of this a/c with the long barreled MG151/20 in the lower gun positions, however no photos of the a/c IN German markings show these long barreled weapons installed. I believe that this a/c received a paint application as Red 8 (described in detail below) in the basic paint application of RLM 76 and RLM 02. However the application of the mottling was somewhat different. Be aware that I only have seen clear photos of the left side of the machine. The mottling on the nose section to the rear of the gun doors and the fin area being applied in hazy doughnut shaped mottles of a fairly intense application. The center section of the a/c also received doughnut shaped mottles for the most part but they were translucent. There is also the possibility that the mottling on the fuselage MAY have seen restricted to only ONE color perhaps a RLM 81 variant, RLM 83 or possibly RLM 75 but I tend to think it was one of the greens. The wing and stab fairings were mottled as were the canopy frames and antenna mast. The radar support arms also received an indistinct overspray. The upper surfaces of the wings and stab are presumed to be painted in RLM 82 as in Red 8. The undersurface paint application is interesting, RLM 22 black covered the entire undersurfaces and nacelle flanks and upper forward nacelles. The black application appears to extend over the entire upper surfaces of the wing slats. It is not know how far the black extended past the wing slats onto the wing upper surface, IF it did at all. The rear upper surfaces of the nacelles appear to be painted in RLM 82 like the rest of the wing. The other demarcation lines of the black paint are similar to the other a/c patterns. Both the drop tanks were RLM 22 -no worn paint. Simplified late war markings were applied and the red 12 was thinly outlined in white. The work number was applied to the fin in black and stenciling was applied but I do not know if the full set was carried. 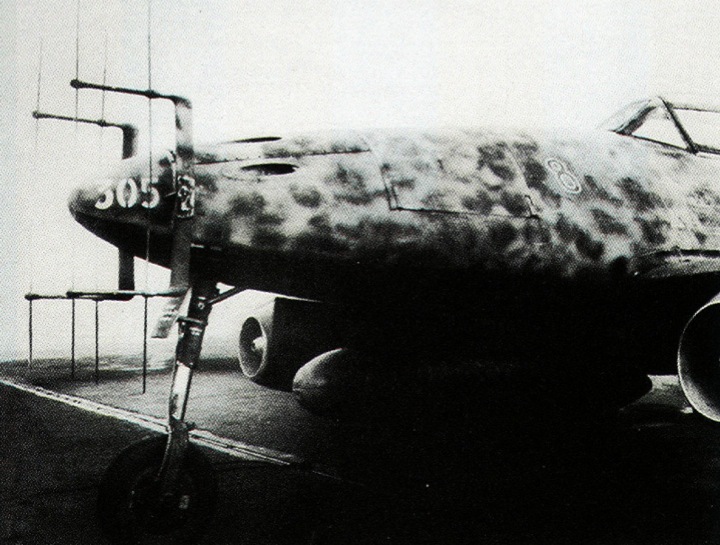 This Me 262B can be considered a "Rosetta Stone" of camouflage information. After capture the a/c was shipped to South Africa where its original camouflage was kept intact until it was exhaustively examined by Mr. R.R. Belling in 1954 and it is our good fortune that Mr. Belling made detailed marking and color notes before the a/c was repainted which succeeded in obliterating one of the last authentic Luftwaffe paint applications. (I believe that there are a few a/c preserved in Australia with original Luftwaffe paint still on the airframes.) In 1970 Belling was asked to provide his records so that an accurate repaint could be done by the South African National War Museum, the objective being recreation of the original finish. The story of this a/c its restoration and some excellent artwork can be found in the April 1975 issue of Air International, vol.8 # 4. This issue is well worth tracking down, first rate story, and first rate artwork (shown below). To summarize the colors and markings of Red 8: The fuselage was sprayed RLM 76 over which was applied a light spray of RLM 02 which effectively killed the blue cast of the RLM 76 base coat. This application helped give a base for the mottling application which gave effective ground camouflage from roaming Allied fighter bombers. Over this was sprayed a random mottle of RLM 81 & 82. 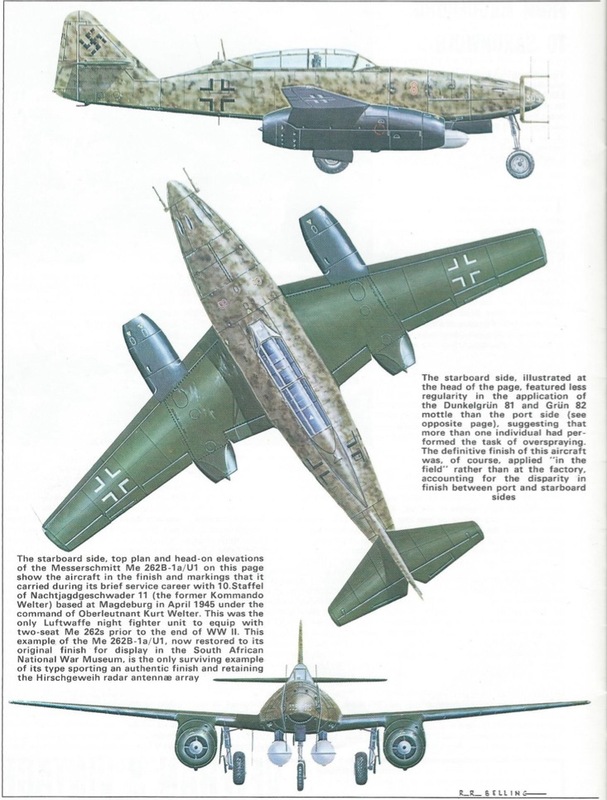 It should be noted that Belling described RLM 81 as "Dunklegrun" not "Brunviolet" The artwork and photos seem to suggest to me that the shade of RLM 81 was similar to the shade of this color used on the NASM's Me 262 that is, a green shade with a brown tinge (Monogram Paint Guide p.37 top left) rather than the brown shade of 81 (Monogram Paint Guide p. 35 lower left) or the very green shade of this color (Monogram Paint Guide p.37 middle left). However, Belling does NOT make any reference to the RLM 81 color having any "brown" tinge in any sense. The possibility that the "Dunklegrun" color may have been in fact RLM 83 is also a distinct possibility. In the early 70s there was quite confusion over the exact color of RLM 81 a Dornier painting document even referring to RLM 81 as "Dunklegrun" The Monogram guide gives 5 different color chips with the RLM 81 designation, varying from dark brown to dark green! So: was the darker mottle color one of the green variations of RLM 81 or RLM 83? The right and left side of the a/c received somewhat different paint mottle applications, the right side mottles being composed of short strokes and lines, the application "sometimes being influenced by panels and fairings with 81 the dominant color being more concentrated in some areas". The left side has a "regularity of mottle" Belling suggests that more than one person was responsible for the painting. (This mottle application difference is also seen on some of the other a/c of this unit). The canopy frames were mottled as were the stab and wing fairings. The antenna and the ENTIRE radar supports are mottled in the restoration; it is very possible that in the original colors the bottoms of the radar support masts were in 22. Also the restored a/c has some extra support arms on the main radar supports that are not evident on the freshly captured a/c. Damage repair, perhaps? The tops of the wings and stab were painted in solid RLM 82. The tops of the nacelles were painted in a way that would relate the green tops of the wings to the black of the nacelle sides. This was accomplished using a green color midway between the green 82 and black 22. Originally Belling thought that this color was RLM 80 the tropical green used in Africa. But, what were the chances that RLM 80 a tropical color would be around in Berlin in 1945? However there are possibilities according to Merrick: On late war a/c studied in Australia (Bf 109, Bf 110, Me 262) there is a dark green primer color (RLM number unidentified) seen on interior surfaces. This color is similar to RLM 80 but has distinct differences. The other is that the nacelle tops were simply RLM 83, and that the solid application of the color looked different from the application of the mottle on the sides of the machine, assuming the mottle color WAS RLM 83. The bottom of the wings and fuselage was painted in RLM 22 along the demarcations described for other a/c. At the time of capture the a/c had one black drop tank and one in unpainted metal. Belling has both tanks in natural metal on the restoration and finished with a coat of clear lacquer RLM 99 (wasserhell). Simplified late war markings were applied with full stenciling. The Red 8 was thinly outlined with white and applied with a slight forward slant. Belling says the marking "displayed clear signs of being applied hurriedly, being crudely finished". The "last 3" of the work number were applied in white on the nose no work number was applied to the fin. Interestingly the sub dividing radar console and seat frames were painted in RLM 81 (see color discussion relating to this above). The rest of the cockpit was finished in RLM 66. Again for the full story and "raison d'être" of the colors applied the Air International article is strongly recommended. One post script a few years ago Red 8 was repainted again but not in the original pattern. In its place applied was one of those visually appealing but spurious patterns. Also the brown version of RLM 81 was used in the mottling. All in all quite a shame! I cannot be certain if the very bottom of the rudders were painted black or retained the fuselage camouflage. It appears that more than one person painted these a/c. This makes sense as such a camouflage application would be a large job for one person. Most of these a/c have distinct paint application differences from left and right sides of the a/c which would be expected if different painters painted each side of the a/c. It is interesting that of the 4 a/c captured none had identical overall paint applications. Experiments perhaps to find effective ground and nocturnal camouflage that could be combined on one a/c? Also all of the a/c did away with light colored RLM 76 undersurfaces which had been used by German night fighters for quite a while. Were the night time skies now so lit up with searchlights and ground fires that like the British Lancasters, dull back was found to be a better camouflage color? 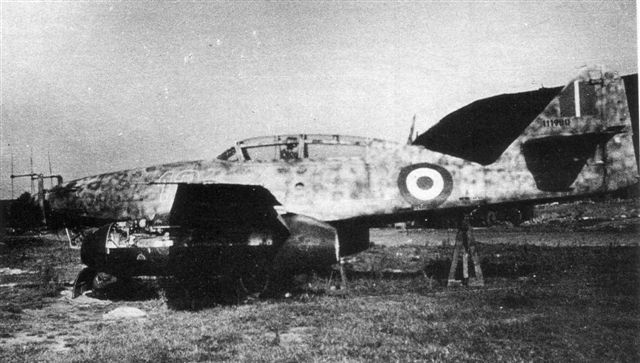 For those interested; the Me 262 night fighter and trainers were not identical airframe wise. Different cockpit sills, different length rear cockpits, different height canopies, different fuel access ports, different fuel tank locations, different nose cones, different foot step locations on the fuselage and modifications to the interior fuselage cockpit tub and rear bulkhead area to accommodate the different cockpits tubs.